The site is owned by the BBONT (Bucks, Beds & Oxon Nature Trust). Local people are friendly and generally supportive of our flying activities. Partly due to voluntary work carried out by our members we also have a very good relationship with the BBONT warden. Please immediately report any incident that could endanger this relationship to the DHPC site officer. Chinnor is a very enjoyable site to fly, with a 5 mile long ridge to explore. However, in past times it was never a popular site due to the limited take-off area and almost total tree coverage, and was only flown by a handful of members. Why? Well the launch can be tricky behind the trees and with restricted top landing it made it a one-flight site. The bottom landing needed careful planning, especially on a hang-glider, and it put a lot of club members off flying here. The other reason was the wind direction, as it takes a North-westerly, which covers the same direction as Dunstable. 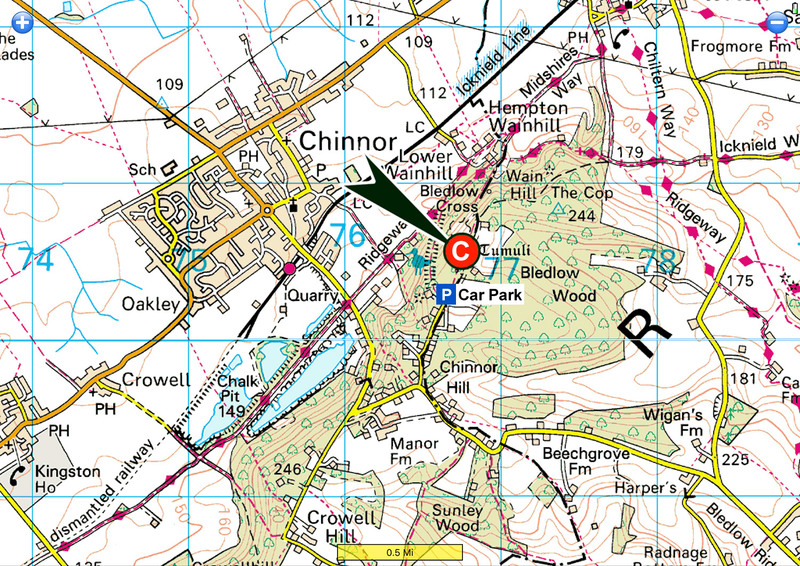 Chinnor's X/C potential downwind is limited as far as High Wycombe, where you run into London TMA at 2,500ft. However, the other possibility is a flight all the way down towards the M40 motorway. This over recent times has now changed and more club members seem to be flying this site and with continued shrub clearance, even top landing has become a little less precarious. Top to Bottom: 410ft (125m) from the launchpoint. Parking at the site: Use the Hill Top Lane car park only. Do NOT leave anything valuable in your car as this car park is often targeted by thieves. We have been informed by Mike Turton from BBONT that effective immediately, that due to the increasing number of car break-ins recently, BBONT has officially closed this Car Park. However, it can still be used for parking but only at your own risk. Parking anywhere else in the area of the site is also subject to a high risk of break-ins and the local Police are on an heightened alert. Chinnor is situated equidistant between Thame and High Wycombe, 3 miles Northeast of junction 6 on the M40, on the B4009. From Dunstable, take the B489 Tring Road and follow the signs to Wendover. Drive through the town on the B4010 to Little Kimble. Turn right at the road junction then turn left under the railway bridge onto the B4009 to Chinnor. When in Chinnor village turn left and then straight over the roundabout and up the hill. Halfway up turn sharp left to Bledlow Ridge, and at the brow on a bend turn left into Hill Top Lane, the car park is at the end of this lane. A footpath heading north through the trees leads eventually to a clearing which is the launch point. STRICTLY NO VISITORS. The site is for Dunstable members only. Due to the difficult launch and top landing, this site is not recommended for the inexperienced, it is for this reason Chinnor is Pilot (P) Rated.You should speak to a Club Coach/experienced Chinnor pilot before you fly, if you haven’t flown here before. The site has a height limit is 4500ft QNH because of LTMA. 1/2 mile NE the height limit decreases to 3500ft QNH. Watch out for Sailplanes on the ridge. The Launch area is completely surrounded by trees, therefore caution is advised when assessing the wind strength and direction at launch. The true wind speed is extremely hard to judge. Often the wind at launch seems very light yet its perfectly soarable. If the wind on the ground is 10 – 12mph the true wind could be 25mph. Watch the trees behind takeoff to try to assist in assessing the wind speed. Hang glider pilots must treat this take off as a nil wind launch and maintain plenty of speed. A committed take off is essential, as the slope is shallow, in order to counter the turbulence near the trees. A windsock placed halfway down the hill is strongly recommended to indicate the state of the air you will encounter during the most vulnerable part of your launch. Paraglider pilots must maintain good airspeed and fly actively being mindful and prepared for turbulence off of the trees to the north. Always asses the wind carefully and avoid being blown back. There are no safe landing options behind launch. The launch can be really turbulent if the wind is off to the North, as the wind rolls over from the bowl to the right of take-off. However, If the wind is off to the north the bowl to the right of launch can work well. When flying left along the ridge, don’t cross the road up the hill from Chinnor without plenty of height as the air can be rough low down over Oakley Hill due to the old quarry works. Have plenty of height if attempting to fly further across the quarry. In thermic conditions, in strong sink you could end up going down fast. If you are forced to land in the quarry, or worse still the deep cold water at the bottom, your landing is likely to be fatal. It is possible to top land back on the Launch area when conditions are favourable, BUT… this should only be attempted after you have gained the experience by flying the site many times. This top landing is technically demanding with little provision for error and no overshoot options! It is totally AT YOUR OWN RISK that you attempt to top land back on the main launch point! Especially be aware of the rotor from the trees in front. It is for these reasons that the DHPC do NOT recommend top landing this site. You have been warned! At present we do not have an Official Landing area, as the hill is not flown on a regular basis. The unofficial bottom landing sites are the Sports field next to the road for paragliders only, and the footpath in front of the hill. The Sports field can be very tricky as its fairly small so new pilots are advised to check out the field before flying to assess its suitability. If you are forced to land out in the farmers’ field, pick up your glider immediately and walk it along a tram line to the edge and pack it up there. Please do not fold up your glider out in the field even if the field appears to be unplanted.